Place the players and coach as shown. When the coach dumps the puck into the corner, players set up in their break out positions. Center must watch very closely which corner the puck is dumped into. 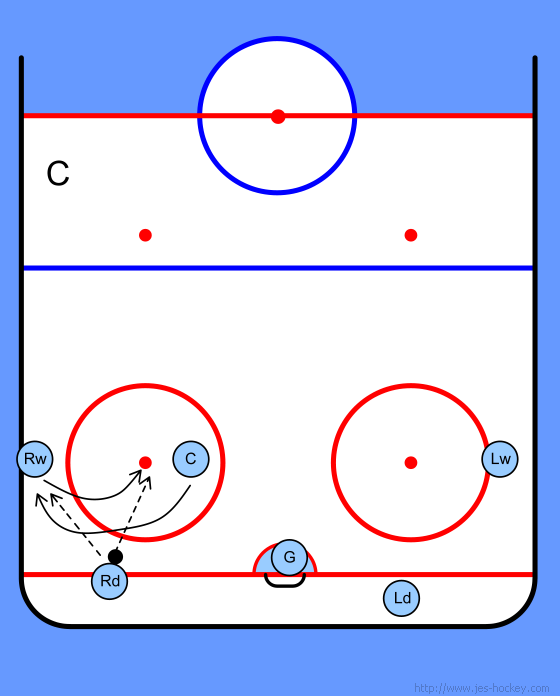 The center must swing into the opposite direction the puck goes in. Why - When the puck gets dumped into the corner by the opposing team, that side becomes the strong side. Always exit the puck to the weak side behind the net. • He can send the puck along the boards of the weak side where the winger will be waiting. The Rd should be behind the net ready to assist the Ld, not in front of the net. This will give the Rd two players to pass the puck to.